Atum Developments is one step closer to bringing to fruition its mammoth development project in Paphos, having successfully submitted its applications for licensing to the Ministry of Interior. The development of a complex worth 3.4 billion euros by the Hungarian investor Atum Developments includes the creation of an artificial island, luxurious five-star hotels and skyscrapers, a university, a medical center, conference rooms and event venues and own marina. The project will have a positive impact on the economy of Cyprus; there will be about 10,000 new workplaces, an annual income from tenants of retail space and offices. The Peninsula is the first phase of the overall development. Initially there will be three towers on this unique piece of land by the sea. The largest tower will be a 5 star hotel and the other two buildings will have luxury residential apartments. Because of the shape of the peninsula and the shape of the buildings virtually all apartments and hotel rooms will have spectacular sea views and, in the future, a panoramic view of Divina Island. The Peninsula will have a total of 168 hotel rooms and 175 apartments making it the largest hospitality and real estate development in Paphos. Each of the two residential towers will have 11 levels and the hotel 14 levels. On the premises there will be facilities for shopping, restaurants, beach clubs and a Spa providing exclusive wellness treatment packages. Health and Wellness is at the core of the concept as such there will be a Health Centre, providing first class treatments from both Eastern and Western medicine. 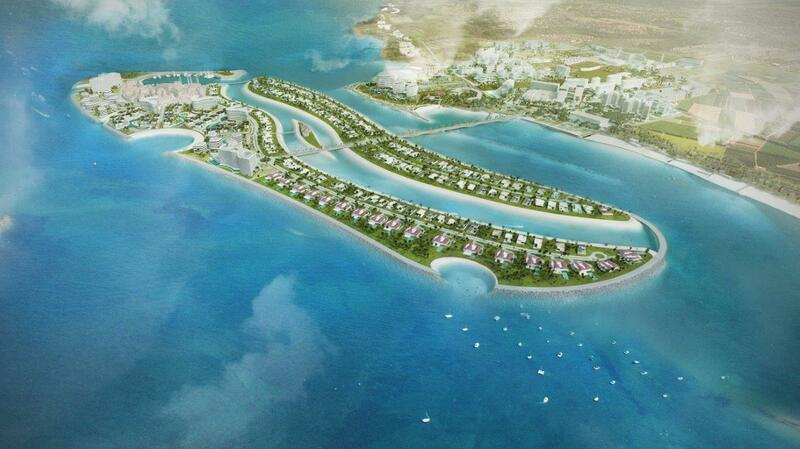 Divina Island is going to be a man-made island development that is located in front of the Peninsula. On the island you will find the most exclusive beachfront villas of Cyprus as well as a number of luxury resorts with hotels and apartments. Divina Island will have its own promenade and Mediterranean village, which is for residents of the community as well as for visitors. A number of activities are enivsaged so that our guests can experience for example the sea life either at Divina Aquarium or via eco-tours from Divina Harbour. The Garden of Eden is expected to become an entire new district of Paphos that will attract Small and Medium Sized enterprises and educational centers connecting young professionals of Europe, Asia, and Africa. This hub will include an R&D Centre as well as the International Cultural and Congress Centre of Cyprus. Paphos is the city with the richest culture in Cyprus, which is why it has received the honors to be the Cultural Capital of Europen in 2017. Eden City (Cyprus) is located on the south-western coast of Cyprus in Paphos in the district of Yeroskipou. The touristic areas such as the historic Port of Paphos are just a few minutes’ drive. The closest airport is Paphos International Airport, which is only 10 kilometers away. The second alternative is Larnaca International Airport, which is a 1,5 hour drive on the A6 freeway. Eden City is 5 minutes’ drive from Paphos' historical center and shopping areas. It is an excellent location to either spend the time on the best beaches of Cyprus or to go explore the treasures Cyprus has to offer such as the birthplace of the Goddess Aphrodite and many other UNESCO world heritage sites. The residents of Eden City will have access to many outdoor sports facilities that can be used all year round thanks to the climate. This includes tenis courts, football fields, equestrian facilities, basketball courts, and more. There are also a number of first class golf courses within a short drive making the location of Eden City ideal for golf enthusiasts. Welcome to the Eden City!